My stall is a 10ft square white medieval tent with blue bunting. It will be somewhere in the historic traders section of the field. Please note that the event is closed to the public on the 2nd and 3rd of May. I will have a tent in the Anglo-Saxon Village of Regia Anglorum. it would be best if you emailed me ahead of time to make sure that I am free. I am very much hoping to get accepted for this event this summer. I am still awaiting the organizers reply. It will be near the main entrance. This will be a 4-day course at home in my workshop, the dates to be confirmed at the participants convenience. You will experience making your own museum-grade medieval shoes. Teaching languages English and/or German. 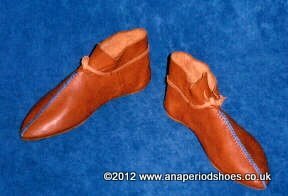 This course is at apprentice level and covers only the ASSEMBLY of a pair of medieval shoes. Sorry, but it is not possible to transmit a lifetime's worth of experience and research in a mere 4 days. 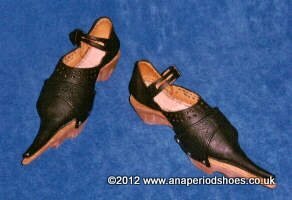 It does NOT cover pattern-cutting, nor all the research that I have done into historic shoes. This course is aimed at hobbyists and is NOT sufficient to enable you to set up in business.